It rained a half-hearted, dribbling drizzle for much of the day today, so I resigned to doing jobs I'd never bother with. I sorted my iTunes library (told you) and built a shelving unit for my daughter's bedroom. This was enough to drive me insane so despite the rain, I headed out to Little Langton for some air. I started by scoping out the last remaining flood pools. There were plenty of teal, common gull and lapwing on and around the water, dotted with the odd curlew, lesser black-backed and black headed gull. A pair of oystercatcher flew in unusually close, but I'd left the camera in the car as the site is usually hopeless for photography. Typical! At the church, I could hear a scratching call coming from the hawthorn shrubs next to the creek. I thought it was siskin and hoping for a year tick, tracked the singing bird down. To my surprise, it was a male blackcap (presumably the individual I saw on Firecrest-day, for which it will now be known). The surprise was how softly it was singing; it sounded as though it was humming to itself, perhaps practising for the day he begins his chorus in full. I've witnessed this 'muted singing' before from a garden warbler. I wonder whether there is a good reason this happens, and whether it only happens with warblers? Moving on to the river, there was further evidence that the wood was slipping into the valley, with runs of orange mud streaking across the footpath and about a yard of exposed roots on trees at the very top of the bank. I became unusually spooked by the idea of being in the wood during a landslide, so was grateful to come out at the other side, covering the last twenty yards with a skip. As I emerged into the light, I was immediately aware of an hirundine bird in the fields opposite. 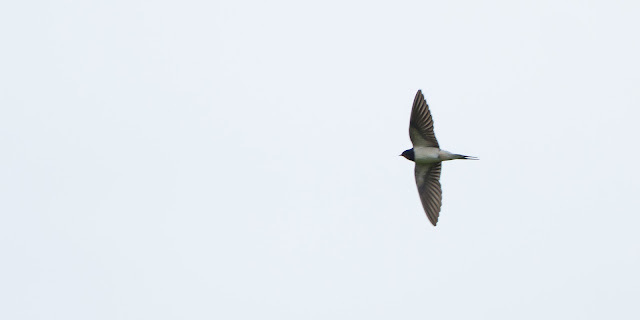 It was my first swallow of the year, and as I stood watching it was joined by another. I met the owner of the farm that surrounds the church for the first time. We shared stories of recent sightings; me regaling him with Firecrest-day anecdotes and he sharing a recent experience where he'd caught jack snipe in the hand right next to the church! I was sceptical but he was able to produce photographs to prove it. Unbelievable! I've now been granted access to the farmland and hope to find my own very soon. While we were talking the group of swallows had swollen to six birds; clearly this is the start of the influx. Roll on summer.